RSMSSB Recruitment 2018 - Apply Online for 1736 Pharmacist Posts in Rajasthan on Direct Recruitment. 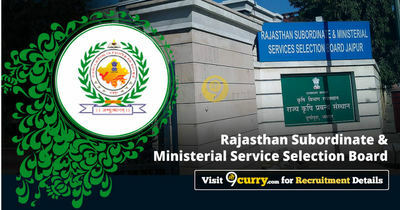 Online Applications are invited by Rajasthan Subordinate and Ministerial Service Selection Board from 16 Aug 2018 to 15 Sep 2018 till 12 Night for 1736 vacancies. RSMSSB Pharmacist Exam Date 2019: Rajasthan Subordinate and Ministerial Service Selection Board has announced Exam Dates of Pharmacist Exam 2019. Pay the fee through credit card/ debit card/ net banking/ E Mitra Kiosk. Age relaxation will be given as Per Govt. Rules. Candidates will be selected on the basis of Exam. Eligible candidates may apply online at RSMSSB's website (direct link is given below) from 16 Aug 2018 to 15 Sep 2018 till 12 Night. Candidates should log on to "http://www.rsmssb.rajasthan.gov.in"
Visit the 'Recruitment Advertisement' and read the information carefully. Click on Apply Online and Register if you are a new user. Complete the Registration & Click on “Submit” to generate 'Single Sign-on (SSO) Id' and Password. After Registration, Log in with SSO Id & Password. Preview the application form and read the submitted information carefully and submit the form. Pay application fee Online & then Submit the Form.